Til Chikki also called Til Gajak or Tilgul. Til Chikki is favorable during winter because of its health benefits. Til Chikki is most popular during festivals like Makar Sankranti and Uttarayan in Gujarat and Maharashtra. 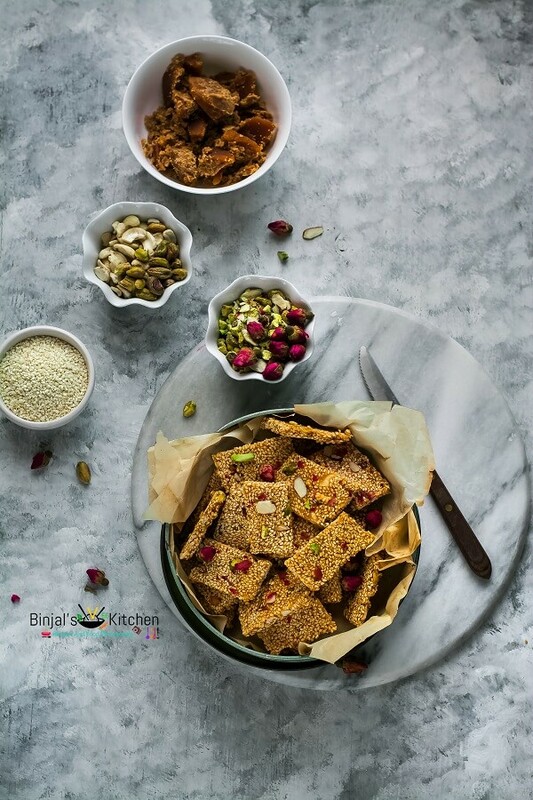 This crunchy brittle, Til Chikki is made of jaggery and sesame seeds. You can have it whenever you crave for something sweet. 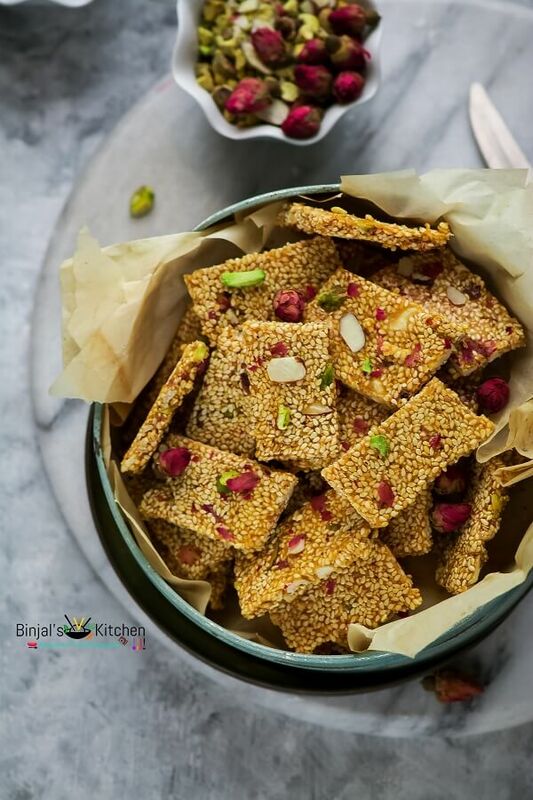 Til Chikki is made up of Sesame Seeds and Jaggery, so it is healthy too. Jaggery is a rich source of iron and protein. Sesame seeds are also healthy due to their nutritional content, including vitamins, minerals, natural oils, and organic compounds which consist of calcium, iron, magnesium, phosphorous, manganese, copper, zinc, fiber, thiamin, vitamin B6, folate, protein, and tryptophan. There are also lots of sweet memories attached with this Til Chikki. When I was a kid my grandma would make Til Chikki in the form of ladoo during Makar Sankranti. But the most excited thing is, she would keep 50 paisa or 1 rupee coin inside the ladoo. So, I was always thrilled while eating ladoo and waiting for what’s I am getting? 50 paisa or 1 rupee!!! I also used to share these ladoos with my friends. I really missing those days now. 1. Roast the sesame seeds in a kadhai/pan on low flame for 2-3 mins. Remove it from the kadhai onto a plate and keep aside. 2. Take a big steel plate or baking sheet, grease it with a few drops and keep aside. 3. Now in the same kadhai, add grated jaggery, ghee and water. Stir it on medium flame till staring bobbling, then cook the jaggery for 1-2 mins, keep stirring. 4. Add roasted sesame seeds, cashew, pistachios and rose petals, mix it very well. 5. Switch off the flame and pour the mixture into the greased plate. Spread it immediately using a bowl when the mixture is still warm, so it will easy to spread. 6. Let it cool down for 5 mins, then make a mark/cut it using a knife or pizza cutter and keep aside. 7. Once it cools down completely, remove the pieces using the knife and store it into an airtight container. • If its problem to remove pieces, just hit it for 2-3 seconds on over the gas top and then remove it. • You can skip any nuts and rose petals. Roast the sesame seeds in a kadhai/pan on low flame for 2-3 mins. Remove it from the kadhai onto a plate and keep aside. Take a big steel plate or baking sheet, grease it with a few drops and keep aside. Now in the same kadhai, add grated jaggery, ghee and water. Stir it on medium flame till staring bobbling, then cook the jaggery for 1-2 mins, keep stirring. 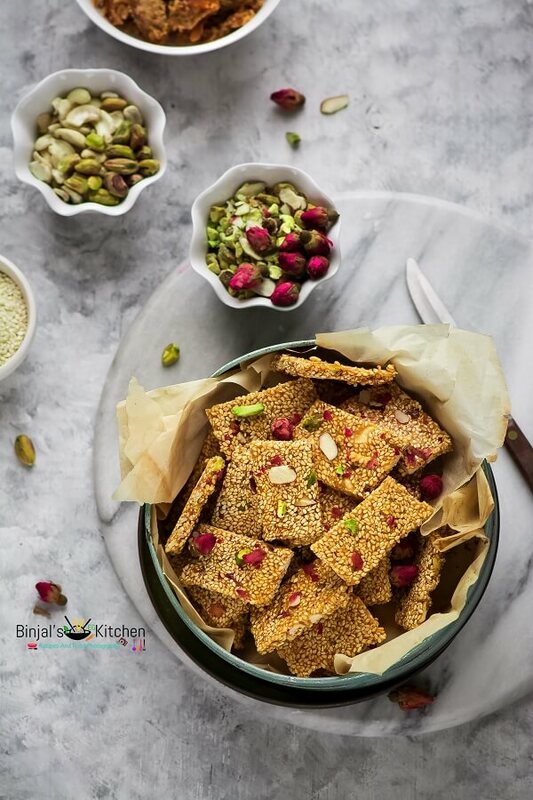 Add roasted sesame seeds, cashew, pistachios and rose petals, mix it very well. Switch off the flame and pour the mixture into the greased plate. Spread it immediately using a bowl when the mixture is still warm, so it will easy to spread. Let it cool down for 5 mins, then make a mark/cut it using a knife or pizza cutter and keep aside. Once it cools down completely, remove the pieces using the knife and store it into an airtight container. Your recipes and photos look fantastic.